Discover the Secret to Writing a Product Launch Email Campaign From Scratch! 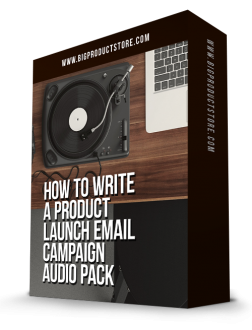 - The exact proven pattern to create a product launch email campaign that converts. - What you must include to get your reader to stop what he's doing and buy your product. - How to read the emotions of your prospect or subscriber (so you send the perfect email to get the sale). - Exactly what to do to get your prospect fired up - and begging for your help. - How to steer your reader exactly where you want them to go (no fancy formulas or gimmicks needed). - Why you MUST not miss the window for the first sale (and how building trust makes the sale happen). - How to mix up content and sales emails that turn your prospect from lead to buyer. - How to figure out which emails are making you money and which you should, frankly speaking, DUMP!!! !